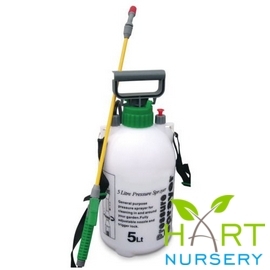 General purpose sprayer for cleaning in and around your garden. "Hello, Bought the 5litre sprayer on Tuesday and so far used only ½ litre each night (per person). Glad we bought the item .. only problem is that the lance definitely cannot be bent! Perhaps shortening to about 15cm will help reaching behind your back? Anyway I had the correct plastic tubing handy.